Delivering great customer service used to be a ‘nice-to-have’ in the business world. From time to time things like customer service training programs would drift into the conversation at executive levels, but would just as quickly drift away as the topics changed to more ‘serious’ things like creating efficiencies, meeting revenue targets and other, more easily measurable, operational things. This, of course, has changed. Ensuring positive customer experiences is no longer an optional part of a business model. It is now basic table stakes for companies that want to stay in the game. Those who haven’t figured it out yet are watching their business slowly erode, with no clue as to why it’s happening. Some very notable ones may already be past the point of no return. There are several controllable components of customer experience, but none are more important than the human element: Customer Service. Great customer service experiences increase customer loyalty, reduce customer churn, increase employee retention and decrease escalations of issues. A skilled service provider can compensate for a myriad of process and policy failures. One single unskilled one can have catastrophic implications in a world where global word-of-mouth is a mouse-click away. 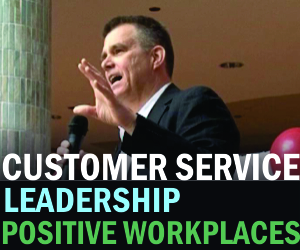 Every organization needs a solid customer service training program. Why are you thinking of the training? Where are the gaps? What is the outcome you want? Just saying you want to ‘take it to the next level’ isn’t good enough. Based on a solid assessment, what are the specific skills that will fill the gaps in performance? Those are what the training should focus on – nothing else. Is the customer service training program designed to appeal to adults, or to school-kids? (Too often, the latter is the case). Are the examples and solutions specific to the workplace, or are they too general to be applied? Is it an interactive format? If it is less than 75% interactive exercises, it will fail. Traditional training design techniques don’t work in customer service training. Because everyone already has preconceived ideas about customer service, you have to build in tricks, traps and surprises to facilitate buy-in to new skills. A great number of people who train customer service come across as condescending and maybe a little preachy. This is because they neglect to acknowledge and leverage the experience in the room. Yes, you might need to remind people of the importance of smiling, but you don’t want to present it as though this is news to anyone. This is a critical training skill that a lot of trainers unfortunately don’t have. A big component of customer service is attitude. If the trainer isn’t truly passionate, he/she will never get people to buy into the skills. There is a belief in the training & development world that a professional trainer should be able to deliver anything. But delivering on a topic in which everyone in the audience already considers themselves an expert requires a lot of confidence and credibility. Trainers need to go beyond the leaders guide and really become immersed in the subject matter. Theory isn’t good enough. In order to move from theory to application in the workplace, there needs to be time to practice. Role-playing, skits, demonstrations are critical. If a customer service training program doesn’t have people walking out of the door excited, it’s not going to stick. The real key to stickiness is what happens after the training. You need to make sure that there is are processes and people in place to actually measure and support the change. Don’t leave it to chance! Whatever you do, don’t leave a customer service training program to chance. If you’re going to commit the valuable time of your team to attend the program, make it count. The Belding Group is a global leader in customer service training, and customer experience consulting and measurement.